The main cause of externalities arises because the social cost of systemic financial collapse exceeds the private cost to the individual financial institutions (and markets). A collapse of a financial institution causes risk spillovers. 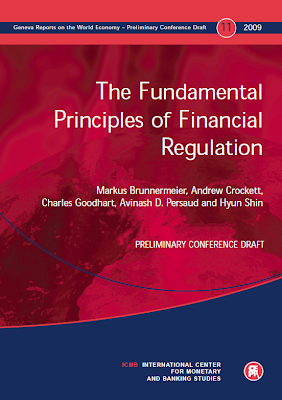 Effective regulation should provide incentives for financial institutions to internalize these externalities (risk spillovers). The main cause of systemic collapse is endogenous risk, the likelihood of self-amplifying spirals like the loss and margin spiral. Stress tests examine the responses of banks to exogenous risks. By construction they do not incorporate endogenous risk. Completely new techniques, perhaps based on models and endogenous risk-spillover measures, like CoVaR, need to be devised to explore the implications of endogenous risk for the system. Requirements based on minimum capital ratios do not provide resilience, since they cannot be breached. They represent a tax, not a source of strength. Requirements should, instead, be normally restated in terms of higher target levels of capital, with a specific, statutory (i.e. not discretionary) and forceful ladder of increasing sanctions. This ladder should have a minimum point at which either the deficiency is satisfactorily redressed, or the institution is shut down, i.e. prompt corrective action, p.c.a. The response to the current crisis has led in several countries to a further concentration of the banking system and, perhaps, elsewhere amongst hedge funds. Greater intervention to encourage competition and to prevent oligopolistic behaviour may well be warranted. There was an interesting article in Newsweek recently that talked about Canada being the pillar of the banking community because its typical leverage was about 18 to 1, versus about 60 to 1 in Europe. Surely all of these banking concerns go back to simple leverage?